Phoenix takes DUIs very seriously, judges have mandatory DUI penalties, which include jail, counseling, fines and fees, revocation of your driving privileges, and placement of an ignition interlock device on your vehicle that you are responsible for paying. Phoenix judges also have discretion during sentencing where they can have you participate in community service, and place you on probation. 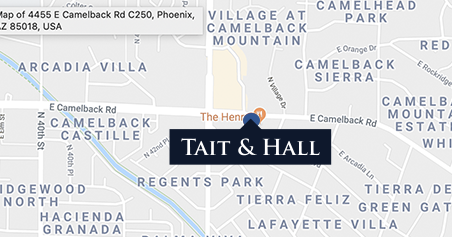 Tait & Hall is a full-service law firm consisting of a team of experienced and well-seasoned attorneys who will aggressively fight to dismiss your Phoenix DUI charges. If unrepresented, seeking dismissal or reduction of your charges is difficult and quite improbable. Many common mistakes are easily made without proper legal advice. Our team’s goal is to seek dismissal of your case, which is precisely why our team will zealously represent your interests. Tait & Hall will fight for you. Our team often represents clients who have been charged with a DUI in Phoenix. Not only does our team have extensive litigation experience, but we also possess the requisite skills, knowledge, and training necessary to provide you with the best defense possible. We will scrutinize all of the alleged evidence against you, ensure that your constitutional rights remain protected, and use all of our resources to effectively defend your interests by providing the appropriate defenses for your DUI charges in Phoenix. At Tait & Hall, our team will pounce on any mishandlings by the officers involved in your case or the prosecuting attorneys and ascertain whether your constitutional rights have been violated. We will protect your interests by aggressively combating these mishandlings and taking the appropriate steps if we believe that your constitutional rights have been violated. Our team has extensive knowledge and experience with Phoenix Courts, having defended numerous clients against DUI charges in Phoenix. Let us fight for you. Let us use our talented and aggressive team of lawyers to provide you with the best representation possible in order to combat your DUI charges. In recent years, there has been a crackdown on drinking and driving. And, as such, prosecutors have clamped down on Phoenix DUI defendants. Prosecutors are going to attempt to convict you and place you behind bars. As such, prosecutors will utilize their arsenal by engaging in various tactics to convict you. Prosecutors are not your friend and will use anything you say or do against you in Court. Take these DUI charges in Phoenix against you seriously. You will need an attorney to raise a proper defense and protect your interests. You need Tait & Hall. Our team is full of proven and experienced Phoenix attorneys that will defend your DUI charges in Phoenix where our main goal will be to fight to get your case dismissed or reduce the charges against you. In Phoenix, there are increased penalties for repeat offenders when it comes to DUIs. If you are arrested and convicted of a DUI for the second time, you will be looking at a substantial number of days in jail. Because of the harshness of these penalties, it is imperative that you contact our team at Tait & Hall immediately following your arrest. It is necessary for our team to evaluate any charges filed against you and begin formulating your defense strategy, especially if this is not your first DUI charge. Phoenix is well known for increasing penalties for individuals who are repeat DUI offenders. As such, prosecutors will work hand in hand with police officers to convict you. Our team will fight to dismiss the charges against you. In the unfortunate event that you are charged with an Extreme DUI, you will need our team at Tait & Hall to fight for you. An Extreme DUI is categorized as an individual having a .15 BAC or greater, which also includes a Super Extreme DUI, which is an individual having a .20 BAC or greater. The higher your BAC, the harsher the sentence. Phoenix takes a harsh stance against drinking and driving, especially when the individual’s BAC qualifies for an Extreme or Super Extreme DUI. Phoenix wants these drivers off the road and will use these drivers as an example and a warning. If you are charged with an Extreme DUI, you need our team at Tait & Hall because Phoenix prosecutors will fight to convict you and focus on having the judge enhance your sentence, which could negatively impact you for years. Have You Been Charged With A Drug DUI? Drug DUIs have two types which are being impaired to the slightest degree by a drug and having a controlled drug or metabolite in your system. As such, DUIs are also associated with illegal drugs like marijuana or even a legal drug with a valid prescription. Phoenix police officers frequently charge people with these types of DUIs, and, in those cases, a blood or urine sample is taken from you and tested. Penalties associated with these types of DUIs are just as severe as a DUI involving alcohol and include jail, counseling, fines and fees, revocation of your driving privileges, and placement of an ignition interlock device on your vehicle that you are responsible for paying. Our team at Tait & Hall will represent your interests in these cases by utilizing our extensive litigation experience, skills and training. Our team has significant experience in mounting the appropriate defenses with respect to toxicology results, blood or urine evidence and any other issues that might arise in defending these types of cases. We will fight to dismiss these DUI charges against you. Our team is well-seasoned and proven when it comes to defending you our main goal will be to dismiss these charges.